This image shows a section of the stratigraphy in Ius Chasma, one of several troughs of Valles Marineris. 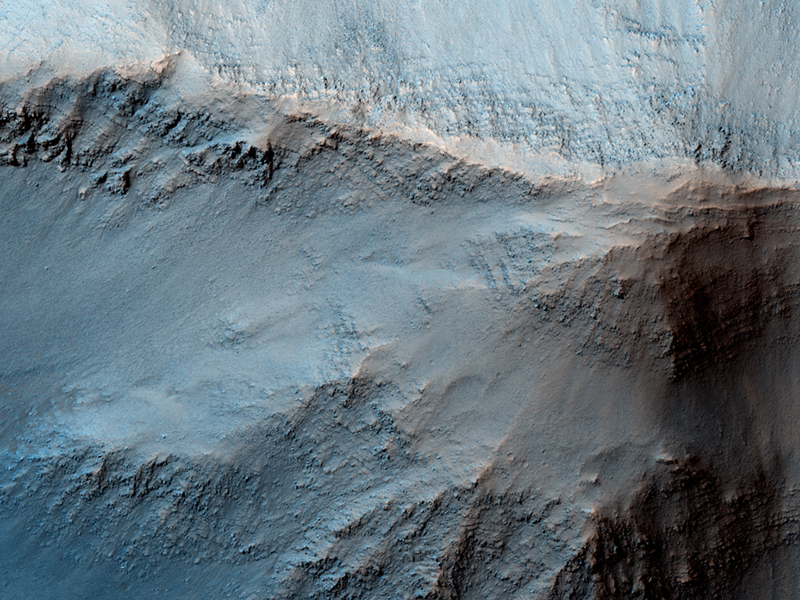 Mass wasting is visible in the top (north) of the image while wallrock can be seen to the south. The wallrock is thought to be composed of lava flows that cover much of the region around Valles Marineris. Most of the image shows the floor of Ius Chasma which consists of aeolian ripples, debris, and layered rocks. The layered rocks are particularly interesting because they are light-toned in brightness and exposed both on the floor and at the base of a hill where wall rock is visible at the top. The observation that some light-toned layered rocks occur stratigraphically below wall rock indicates an older age for these rocks. Their light-toned nature could be due to compositions unlike the lavas, including sulfates or salts, which are minerals found where water once existed. Hence, water may have laid down these sediments a long time ago before lavas buried them. Only where erosion and expansion have exposed enough stratigraphy can we see the whole geologic history of this region, which has been captured so well in this HiRISE image. This is a stereo pair with PSP_009645_1725.